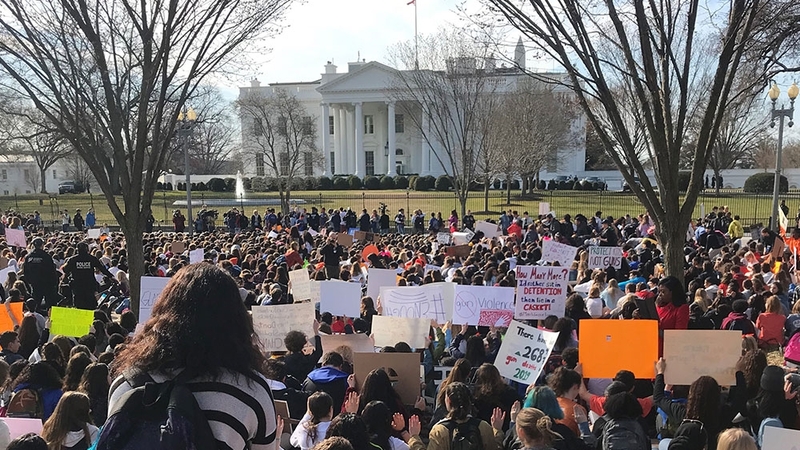 Washington, DC – Hundreds of students have staged a school walkout and marched from the White House to Capitol Hill to demand stricter gun control laws. On Thursday, politicians who strongly support gun-control reforms joined the students who descended to the capital from over a dozen high schools in the Washington, DC, Maryland and northern Virginia-area. “Show me what democracy looks like,” 16-year-old Sofia Hidalgo from Albert Einstein High School in Maryland chanted as she marched past Trump International Hotel on her way to Capitol Hill while others booed at the hotel. “This is what democracy looks like,” protesters shouted. Hidalgo, who plans to go to Florida when she finishes her schooling, has been actively involved in protests against gun violence after the 2018 Parkland shooting in Florida left 17 people dead. While mass shootings have plagued the US for years, the Parkland shooting marked a pivotal moment as students-turned-activists led a nationwide movement to end gun violence. “We are privileged, we are here in the capital where the politicians we are trying to convince are as well. They are right next door,” she said holding up a banner that read: “Arms are for hugs”. Since the Parkland shooting, her school – as many others across the United States – have taken extra precautions to keep unauthorised people off their grounds, including installing extra hallway doors and key access for school-building entry. Schools have also held regular active shooter drills and lockdowns in which students are taught to hide in their classrooms and keep quiet. “A school is a place we should learn and not hide under our desks,” said 17-year-old Cammy. Sage Spalter, an 18-year-old student at Bethesda-Chevy Chase High School in Maryland, said she walked out of class in the morning to come to the capital to show her support. She said she wanted to see the Senate pass the S.42 Background Check Expansion Act, which would help ensure background checks in all states for those who attempt to buy a gun. Thursday’s march was the second school walkout following the Parkland school shooting. Last year, the global March For Our Lives, held on March 24, saw millions of people protest across 800 cities. Under the banner #NeverAgain, protesters called for a ban on assault weapons, a halt to the sale of high-capacity magazines, tightening of the background-check process, the limiting of firing power on the streets, the disarming of domestic abusers and an end to gun trafficking. The same demands were made on Thursday. Some progress has been made over the past year. After pressure from activists, a number of companies, including First National Bank and Enterprise, ended their partnerships with the National Rifle Association (NRA). On the political front, US President Donald Trump‘s administration moved to ban bump stocks, a device that allows a semi-automatic rifle to fire at the rate of a machine gun. More than a dozen states are also set to review their gun-safety laws this year. While Hidalgo is happy her state has passed red flag laws and banned bump stocks, she wants to see gun control laws rolled out at the federal level “to feel safe in Florida as I would here”. Activists at the forefront of the gun battle echoed the protesters’ calls. Since Parkland, a website that has been documenting child victims of gun violence in the US, recorded 1,200 children killed by a gun over the past year – more than 80 of whom were under the age of three. The Centers for Disease Control and Prevention (CDC) recorded 39,773 gun deaths in 2017 across the country, an increase of more than 1,000 from the year before. More than 300 mass shootings – defined by the FBI as an incident in which four or more people are killed – were recorded in 2018, including in Pittsburgh, Pennsylvania, Thousand Oaks, California, and Annapolis, Maryland, according to the Gun Violence Archive. “We see you,” Democratic congressman Ted Deutch, who represents an area of Florida, including Parkland, told protesters from a podium outside of Capital Hill on Thursday. He applauded the students for staging the walkout, adding their continued organisation helped ensure a democratic majority in the House of Representatives. “Keep fighting, keep speaking, I am so proud, unbelievably proud to be your partner in this fight,” he added. We told this generation that the future is in their hands – and they listened. After the Democrats took the House in November, they passed gun control bills last month – a first in many years. The two bills would toughen background checks for gun purchases. Both bills, however, are expected to face opposition in the Republican-majority Senate and the White House. Some Republicans in the senate are closely allied to the NRA and gun-rights voters.